Comedian/actor/writer Brian Posehn always has a full plate in front of him. He was recently seen on the acclaimed Netflix show Lady Dynamite, FX’s You’re The Worst, and in recurring roles on The Big Bang Theory and New Girl. Brian was one of the stars of Comedy Central’s popular show, The Sarah Silverman Program, and has appeared on such seminal sitcoms as Seinfeld, NewsRadio, Everybody Loves Raymond, Friends, and Just Shoot Me. In the sketch comedy world Brian’s known as one of the writers and performers on HBO’s highly acclaimed Mr. Show. In 2015 he co-produced Odenkirk and Cross’ return to sketch with the Netflix hit With Bob and David. He has also been featured in films like Devil’s Rejects, The Five Year Engagement, and had his first starring role in the dark indie comedy, Uncle Nick. In stand-up comedy he’s known as one of the original members of the Comedians of Comedy. 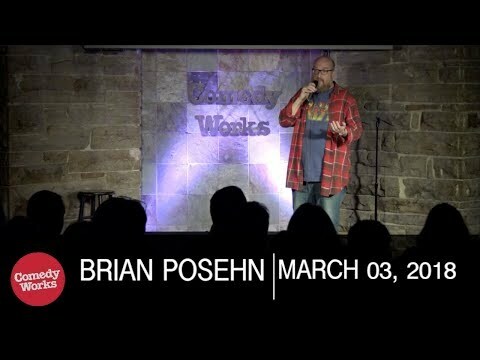 Brian has recorded two half hour specials for Comedy Central, four comedy albums and two hour long specials, The Fartist and Criminally Posehn. In voice acting he’s done everything from Scooby Doo to The Simpsons. He has also been featured in Bob’s Burgers, Adventure Time, American Dad, Steven Universe, and most recently, Captain Underpants. Brian is also the producer and host of the popular comedy podcast, Nerd Poker, and co-wrote 45 issues of the best-selling Marvel comic book series Deadpool. Brian’s first book, Forever Nerdy, was released in October this year.